Shonan Beer Alt is a 5% alt style beer from Kumazawa Brewery. It’s part of their all-year round range of beers that can be found in both bottled and draft form. Not much information is out there about Shonan Beer Alt but it seems that the Enoshima Label version is also an alt, which would explain the original review of this beer being unusual. How do glasses affect beer taste? Shonan Beer Alt poured out a deep brownish red colour with a fair amount of frothy off-white head on top. It looked much lighter at the bottom of the Shonan Beer glass due to the narrowness of it with a much deeper brown colour towards the top. The aroma off of it was of caramel malts and dried raisins without any hops in there. 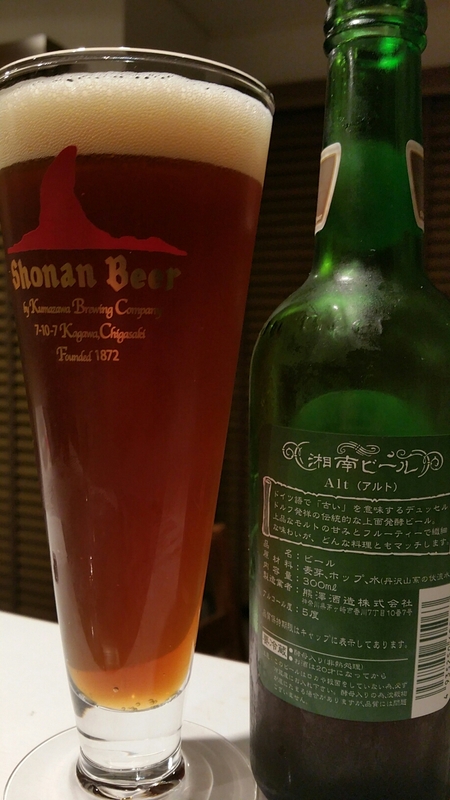 The flavour of Shonan Beer Alt isn’t much different than as to what I expected from an altbier – it’s full of sweetness in the form of a caramel-like flavour along with some dried fruits. Nothing too dissimilar from the original aroma of Shonan Beer Alt. The only major complaint I have about this beer is that the body is a tad too thin to support such a strong level of caramel tones. The aftertaste carried on with the caramel malts before leaving a burnt residual flavour on the tongue. For a flagship beer, Shonan Beer Alt isn’t bad and it’s a good example of what an altbier is though it could do with being less watery.